Apple's commitment to IT industry and it's own iPhone/iPod/iPad enhancements have been regarded as the hottest pocket stuff these years. You might have known that many mobile devices can be charged via a desktop PC's USB ports when the PC system is on. As Apple fan knows that if you want to fully charge your Apple devices via PC, it may take 3 hours or maybe longer to complete! Fast Charge & Charge Anytime! 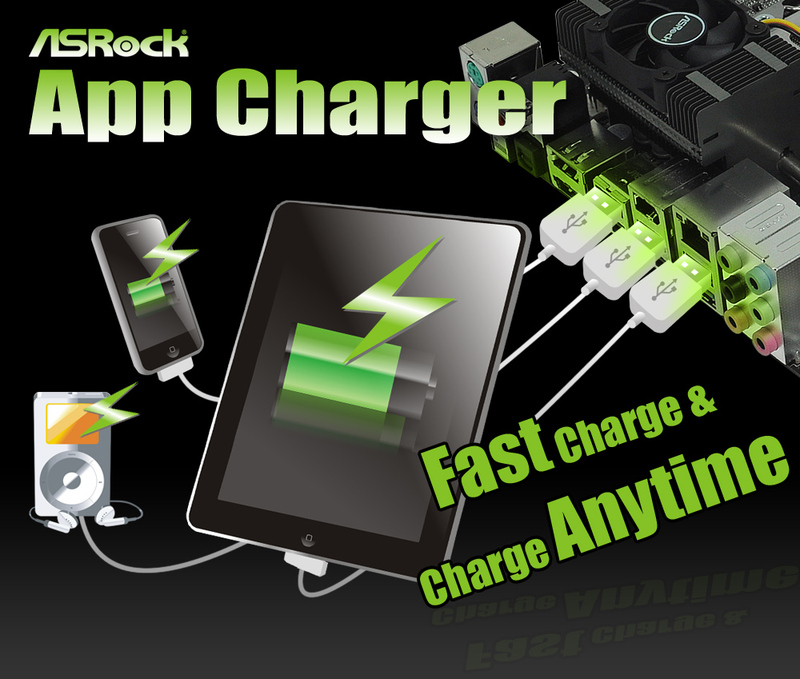 If you desire a faster, less restricted way of charging your Apple devices, such as iPhone/iPod/iPad Touch, ASRock has prepared a wonderful solution for you – ASRock App Charger. Simply installing the App Charger driver, it makes your iPhone charged much quickly from your computer and up to 40% faster than before*. ASRock App Charger allows you to quickly charge many Apple devices simultaneously and even supports continuous charging when your PC enters into Standby mode (S1), Suspend to RAM(S3), hibernation mode (S4) or power off (S5)**. With App Charger driver installed, you can easily enjoy the marvelous charging experience than ever. ASRock App Charger efforts are, to turn what was disappointing feature into a far more efficient one. The App Charger technology has been fully applied on ASRock full series motherboards. With App Charger, you'll never feel charging via a PC like this before. * The charging capability may vary with different power supply design. The more +5V standby current provided, the better charge efficiency you get. ** Please connect the devices to the PC USB ports before the PC enters S1/S3/S4/S5 mode to enable a fast charge. A. If you could find "Deep S5" in BIOS SETUP, please set the option to [Disable]. B. If you could not find the Deep S5 option, please set BIOS > Advanced > ACPI Settings > "PCI Devices Power On" as [Enabled].